A couple weeks ago we made this bbq chicken and it was D-E-L-I-C-I-O-U-S!!! We were skeptical at first but since I found it on Pinterest we had to try it! 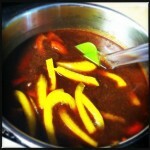 Since I’ve been on Pinterest I’ve tried to make 1 new recipe at least every week. Even if it’s a dessert. I don’t pick meals that are going to take me a long time to make very often, I try to keep it simple. Well when we ate the bbq chicken I said this would be good as a chicken taco. 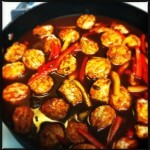 Yesterday I made those chicken tacos and OMG OMG….they are the best bbq chicken tacos i’ve EVER had!! 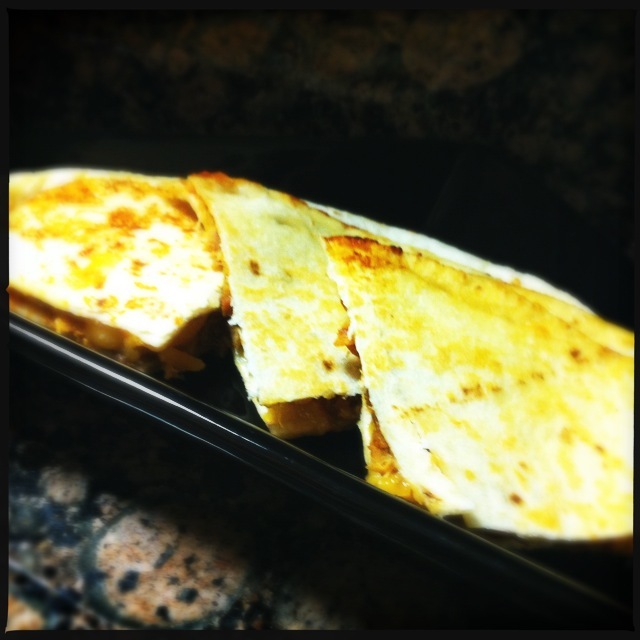 But what was even better was the bbq chicken quesadilla I made. Just look at the inside!! 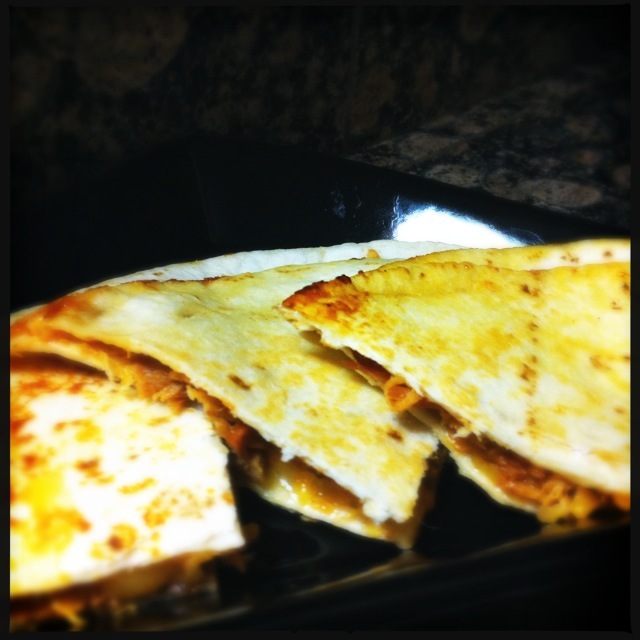 What I did was butter 2 flour tortilla’s, added some of the bbq sauce mixture onto the non buttered side, added shredded chicken, sprinkled a little colby jack cheese on top and topped with the other flour tortilla. Then I heated a skillet on high and added my quesadilla (turn heat down to med-low). 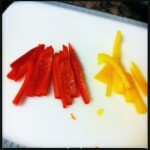 Cook on each side for 1-2 min. It was seriously sooooo yummy!! I’m glad we have tons leftover! Here’s my stepson enjoying his gigantic dinner, lol! 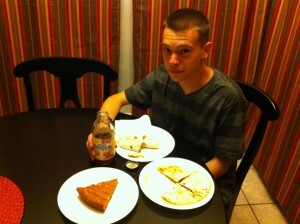 He has 2 chicken taco’s, 1 chicken quesadilla, and for dessert I made a giant peanut butter cookie with mini reeses candies! He was so full he couldn’t even eat the pie slice of his cookie! I’m 32 years old and I just got my first cast iron skillet. I never wanted to clean it up the way it needed to be cleaned so I steered clear of them. But when we lived with my Dad a few years back he would cook us breakfast and I always admired how his bacon was. So crispy, yet chewy, and well just perfect! I watched him and he used a cast iron skillet…I still didn’t want one at the time though. Last week I decided that there’s no reason to not take the time and clean it properly. I have Pampered Chef stoneware and can hand wash that w/out soap and not have any issues so why can’t I commit to the cast iron skillet. I got the biggest Kroger had, on sale for like $18.00!! So you might wonder…..what the first thing I cooked in it was. Well DUH!!! 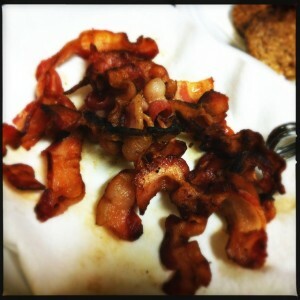 BACON!! Yes…I was finally going to have this glorious bacon…and yes it was glorious!! 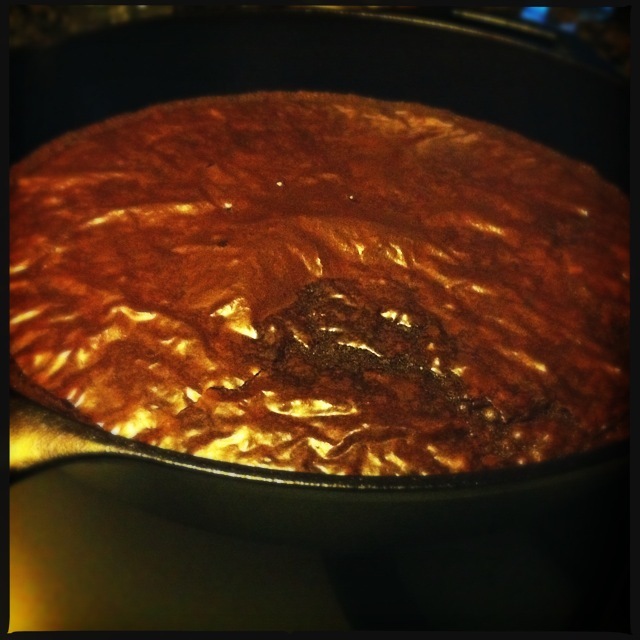 I couldn’t stop there….I also made brownies in it the next day, lol!! I just used regular boxed brownies and LOVED how they turned out too! I have now begun to look for more cast iron skillet recipes. If you follow me on Pinterest you’ve already seen me pinning away!. I found this recipe off the internet a couple years ago and I can NOT find the link to the actual recipe but here it is. 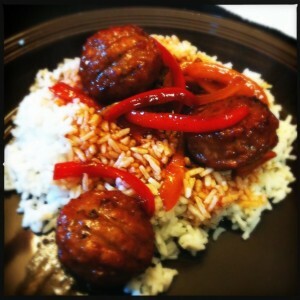 COMBINE all ingredients except rice and meatballs in large bowl and mix well, add sauce and meatballs to skillet; cover. Cook on medium heat for 10 min., stirring occasionally. INCREASE heat to medium-high; uncover. 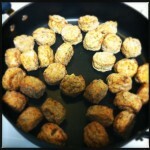 Cook 8 to 10 min., or until sauce is thickened and meatballs are heated through, stirring occasionally. 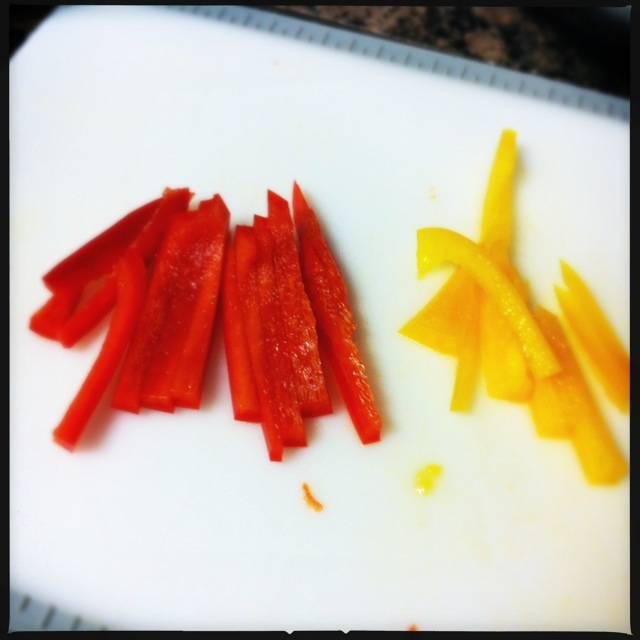 Cut your bell peppers up and add all the ingredients in a bowl and mix. 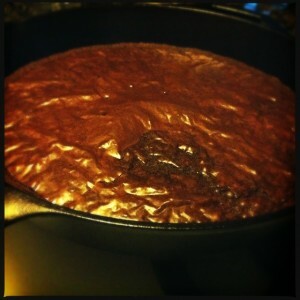 The jelly will be clumpy but once it’s heated in the skillet it won’t be. I usually make the sauce a couple hours before I make the dinner and leave on the counter in a covered bowl. Just so all the ingredients are room temp and marinating together. Plus since it always seems like the kids bug me right when I’m chopping and stuff it’s easier to do this step before hand while they’re busy playing or doing homework. We used Kroger meatballs this time but we can definitely tell you that the walmart ones are WAY better!! 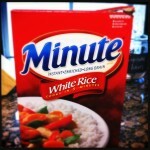 Here’s the rice we use. I usually make 3 cups but need to start making 4 cups of rice. Get a BIG skillet, add meatballs, then add sauce and following cooking instructions above. This is one of our family favorite meals. I use to stress about making this meal because of all the ingredients when I wanted a good quick dinner. I’m sure you could make the sauce the night before (minus the bell pepper–cut those up right before cooking). 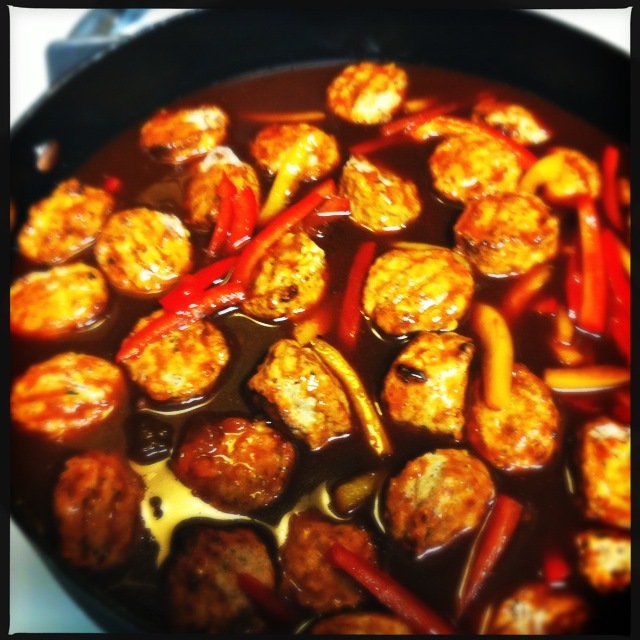 I hope you try this recipe….It’s super delish!. 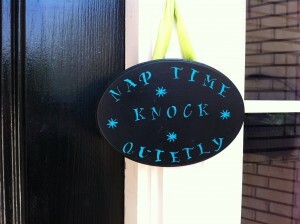 It seems like everyone likes to come ring my doorbell or knock so loud on my door during nap time. If it’s not scheduled deliveries it’s scheduled maintenance (everything seems to be breaking or need maintenance in this rental home!). So I grabbed me a hot pink sticky note and a sharpie and wrote “baby sleeping, please knock quietly!”. It worked 99% of the time, YAY!! But it was UGLY!! So I’d been thinking of hanging a picture outside but couldn’t come up with a cute way to display it. We recently went to a local resale shop and they had several pieces of wood for super cheap….like under 25¢ each. Yup, got those! Then it hit me a couple days later….make a sign out of it. I painted the wood black and used some sticky stencils I got from walmart. My paint is a folk art aqua….I might be redoing it soon to match the green ribbon but it’s what I had and I went with it. Once the stencils were on I brushed the paint on and did 2 coats. After it was all dry I used a matte clear coat to seal it all. To attach the ribbon I used two thumb tacks. I pushed the tacks through the ribbon then hammered them into the back for a tight fit. Oh and I didn’t have any bright ribbon (need it to stand out ya know) and as I was walking away from my ribbon stash all sad that I had to go back to the store I saw it! A gift bag with this ribbon for handles. I cut it off…perfect size! I believe it works too! There was suppose to be a contractor coming to the house today to replace an awning on the front of the house. Our landlord said they’d knock to let me know they were there. So they either didn’t knock or knocked so quietly I didn’t hear them…which I’m totally fine with! My napper napped on and I blogged on….great nap time today (2 whole hours!!)!. So…the king of burgers has come to Texas. Let me tell you first off I HATE burgers!! Seriously I do. 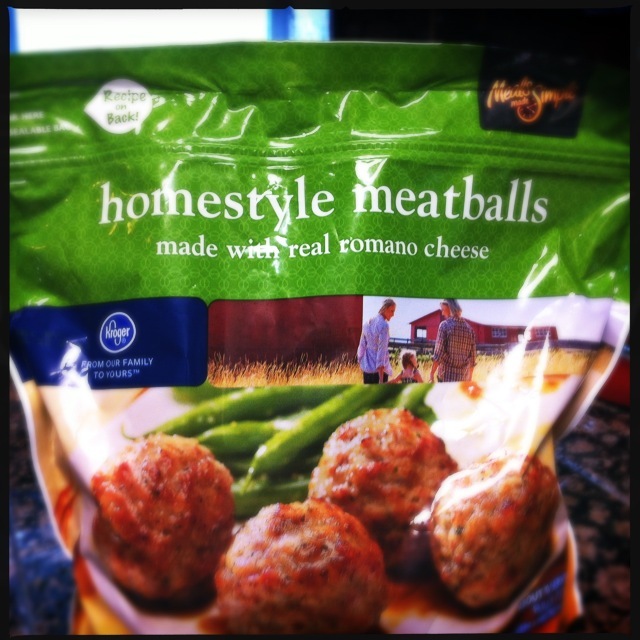 But when my husband told me I had to try them I did. And OMG OMG OMG let me tell you…WONDERFUL!! I had fireworks in my mouth! I think it was winter when the first one near us opened up. The hubbs went very soon after it opened and kept telling me I needed to go. So I eventually did and I crave it all the time now!! 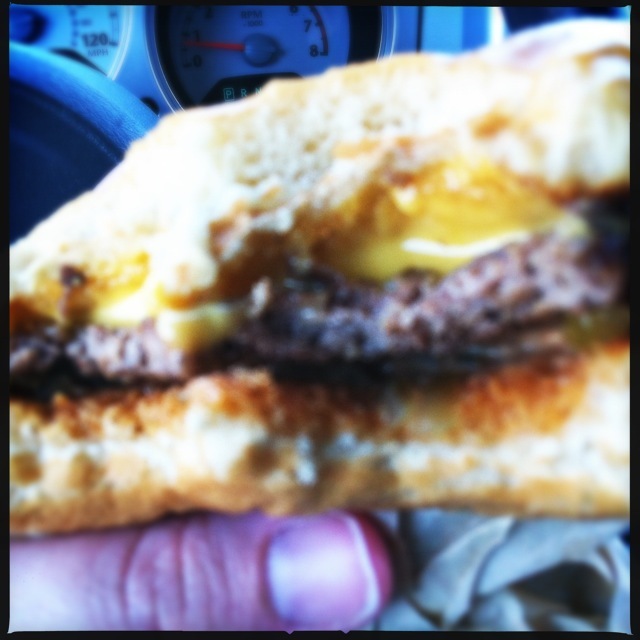 I actually go in person to make my car payment around lunch just so I can eat there on my way home….how sad is that! Then…it happened. One close to my house opened up! It’s still 10-15 minutes away but I got me a burger as soon as I knew they were open. We actually went on Easter and they were closed…so I went a few days later. My order- cheeseburger with spread only, fries-well done, and a coke! Somehow I didn’t get a pic of the fries but they are also the BEST fries around!! But just look at this burger! See that cheese—yes I’m in LOVE!